Chalet Les Rouses is set in a fantastic location on the Pied Moutet side of resort, just off the high street amongst all the shops and bars of Les Deux Alpes. The chalet is only 200 metres (approx.) from the Vallée Blanche chairlift, which accesses the main ski area via a blue run from where you can take one blue run to the Petite Aiguille chair. Alternatively, the ski bus stop is a mere 15 metres (approx.) from the chalet, making access to the ski school and the main Jandri Express cable car quick and easy. Chalet Les Rouses is a beautiful, modern and traditional wood-clad chalet decorated to a high standard with parquet flooring in the bedrooms, tiled floors in the communal areas (with under floor heating) and wooden furnishings throughout. The open-plan lounge/dining area is spacious with plenty of comfortable seating around the wood burning stove. It also has the more modern luxuries of satellite TV and a DVD player. A lovely balcony runs the length of the chalet. All rooms have en suite facilities (rooms 1 & 2 share a WC). There is even a sauna to relax in after a day’s skiing. Our ski holiday to Chalet Les Rouses in February was without doubt, one of the best holidays we had ever had. The chalet itself was luxurious - spotlessly clean, with big comfy sofas and a great sauna. The bedrooms could have been bigger (as is always the case in French chalets) but the beds were comfy and there was surprising little noise given the location. The chalet hosts were amazing, great fun and cooked delicious meal after delicious meal. Despite the resort not having had any fresh snow for over 3 weeks, the pistes were in great condition and it was some of the best skiing i have experienced. I would definitely recommend both the resort and the chalet to all my friends and family. Statistics for ski areas are - I have learned - very easily misread... In particular two figures: the resort altitude and the highest run: can really lead you into bad decisions. Both figures are pretty much irrelevant unless your criteria is to have snow on your doorstep... For example, Chamonix is a 'low' resort (1000m) with one of the highest summits (3800m). But the figures don't tell you that the general ski area is mostly quite low (2000m) - even though there's plenty of high off piste for experts. Indeed on piste it’s a generally low ski area. Avoriaz seems high (village 1800m) but the Portes du Soleil area tops out at 2400m so in the late season you might find it hard to avoid slush. Les Deux Alpes (village 1600m) might be avoided compared with the apparently higher Alpe d'Huez (village 1850m). But this would be a mistake. Les Deux Alpes has a higher piste (3600m) than Alpe d'Huez' Sarenne (3300m) but again this tells you little: Les Deux Alpes’s top piste is flat to the point of being boring (unless you're dropping down to La Grave) whereas Alpe d’Huez’ Sarenne is a classic. What's important is the median height and aspect of the skiing. Last week we went to Les Deux Alpes (a tough choice, I’d thought against Alpe d'Huez)and were pleasantly surprised. The reason is simple: more of the resort's accessible piste skiing is above 2500m than Alpe d'Huez’ and more of it seems to be north facing. Over 5 days of sun we skied snow when in Alpe d'Huez it was more like slush (elephant snot is what a friend of mine calls it). If you want a late holiday don't look for top station or village altitude: ask how much of the skiing is above 2500m and facing north. 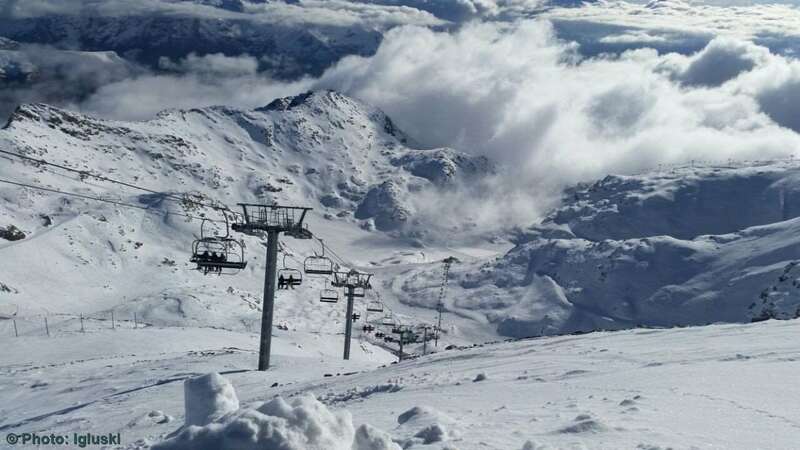 Suddenly resorts like Tignes, Zermatt and Les Deux Alpes make a whole load more sense. A lovely chalet by the way- we were looked after like kings (and queens) by Naomi, Hannah and Joe. My only quibble: free unlimited wine seems attractive on paper but can be disappointing unless the quality is excellent or an upgrade is easily available. Would happily have paid more in the chalet for some tastier options. 0 of 1 people found this review useful.